The Sun and the eight planets which revolve around it form the Solar System. The planets are grouped into two categories: gas giants and terrestrial planets. Every planet has its own unique characteristics. Uranus, which is the seventh planet from the Sun is a gas giant. This massive planet contains gas, liquid and as well as ice and because of this ice it is often referred as an ice planet. For people observing from the Earth, Uranus appears as a blue star and was mistaken as a star until 1781. 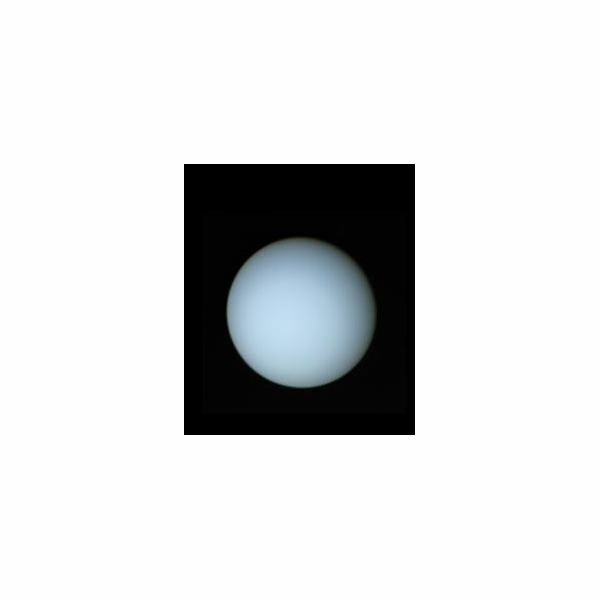 With the help of a telescope, William Hershel identified it as a planet, but it was Johann E. Bode, a German astronomer who named Uranus after a Greek God. NASA’s Voyager 2 was the first man-made object to observe Uranus from a close distance, and its images show a bluish planet. Hydrogen is the primary constituent of Uranus’ atmosphere (83%) with a small amount of helium (15%), methane (2%) and traces of ammonium and water. It has twenty one natural moons and has rings. It takes 84 Earth years to complete one rotation around the Sun in an elliptical orbit. Its interior takes 17.4 hours to complete one revolution on its axis, whereas its atmosphere takes only 14 hours. It is 14.5 times more massive than the Earth, but its density is only ¼ that of Earth. Uranus’ gravitational acceleration is 8.69 m/s 2 and it has a strong magnetic field. It has an atmospheric temperature of -355 degrees F.
How is Uranus different from most planets? It is its axis of rotation which makes it unique. The orbital motion of the planets is counter clockwise when viewed from above the Solar System. All the planets except Uranus and Venus have the same direction for their axial rotation and its orbital rotation about the Sun. Their motion is described as direct motion, where the Sun rises in the east and sets in the west. But, Uranus and Venus have retrograde rotation where the axial rotation is opposite to the orbital motion; that is they have a clockwise axial rotation and a counter-clockwise orbital motion. This means that for Venus at least, the Sun rises in the west and sets in the east. Uranus is a bit different still. Its axial tilt, which is the angle the rotational axis of a planet makes to its orbital plane, is 97.7 degree. This sideways tilt gives Uranus a unique position in which its axis of rotation is nearly in its orbital plane. Since most of the other planets have an axial tilt less than 30 degrees, scientists believe that Uranus might have encountered a collision with another massive planet immediately after its formation. Due to this tilt, Uranus’ poles and not its equator point towards the Sun. Hence if visualized two dimensionally, its axial motion appear to be rolling along its orbit whereas the other planets are spinning upright. NASA flyby Voyager 2 was the only mission to Uranus, so Uranus still remains a mystery to astronomers. The unusual axial tilt and rotation of Uranus have baffled astronomers for centuries and they are yet to arrive at a satisfactory explanation for this.